Next show’s tickets on sale! 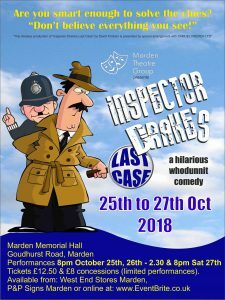 Join us for the ultimate Agatha Christie spoof, as Inspector Drake, ably hampered by Sergeant Plod, interviews a colourful confusion of characters. Buy direct from West End Stores or P&P Signs … or click here for online tickets. PreviousPrevious post:Commercial Traveller a roaring (20s) success!NextNext post:Buy your tickets for Inspector Drake!